Havant Lorry Park offers 24 hour surveillance secure truck parking in Hampshire. The overnight parking in Havant is patrolled by security guards 24 hours a day, as well as having CCTV in operation at all times. The lorry park is fully fenced and has a concrete hard standing suitable for lorries, trucks, commercial vehicles and cars. Havant Lorry Park has secure storage containers for rent in Havant that are wind and watertight with direct access for loading. The self storage containers in Hampshire are accessible 24 hours a day every day of the year. Each container storage in Portsmouth offers 33 metres of cubic storage which can be used for personal items, business items, stock and furniture. 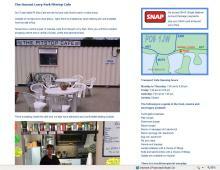 The onsite transport cafe near Portsmouth offers hot and cold food to eat in or takeaway. This top quality transport cafe in Havant also provides a take away food ordering service available from the site office when the cafe is closed. The lorry parking in Portsmouth is located two minutes from the M27 and A3M motorways offering easy access and good transport links. This truck stop near Portsmouth has separate male and female toilet blocks, shower and washrooms suitable for overnight stays.